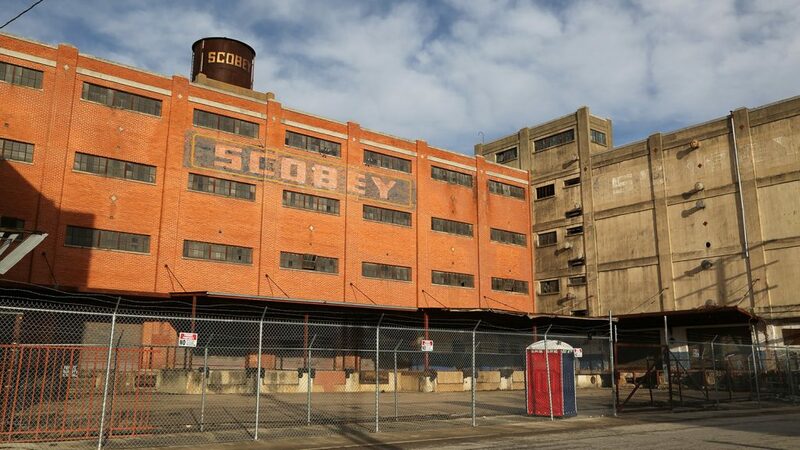 In recent months, VIA Metropolitan Transit staff and members of the Historic and Design Review Commission (HDRC) have met twice to assess the six-building Scobey industrial complex on the near West Side in preparation for a future mixed-use development. 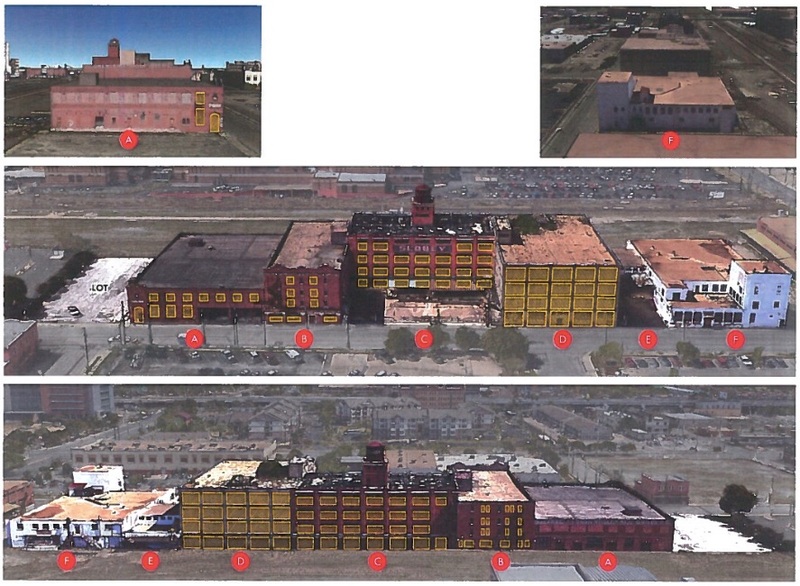 VIA, which purchased the buildings in 2017, plans to rehab the block-wide complex into what it’s calling a “transit-oriented community,” a mix of residential, retail and office space adjacent to its Centro Plaza station at 909 W. Houston St. The project, the first of its kind for the mass transit agency, would add to the flurry of development activity that’s expected in this buffer of lots, government buildings and vacant industrial buildings that separates downtown from San Antonio’s West Side. 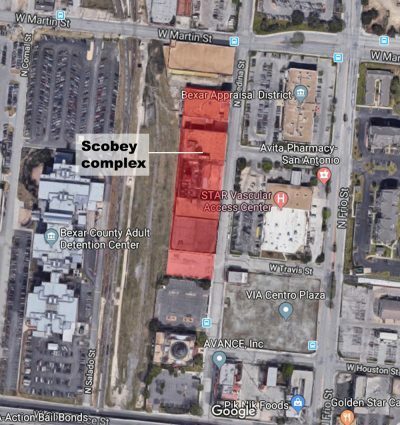 Most of that activity will come from the University of Texas at San Antonio, which is planning to quadruple the size of its downtown campus four blocks south of the Scobey—with new colleges and housing that would stretch across I-35 east into downtown proper, but also west toward the West Side neighborhoods. So far, there are few details on the project—such as the price tag, the total number of apartments, rent levels, etc.—because VIA is still in its due diligence stage of assessing the buildings, said Todd Olson, VIA’s manager of real estate services. There’s also no timetable for when the buildings will go before the HDRC for consideration. Meeting minutes and supporting documents, which were provided to the Heron through an open records request, only mention the integrity of the structures and their facades, and do not address design. When the project does go before the HDRC, VIA will ask for permission to demolish 22 percent of the structures, according to the minutes. VIA will likely partner with a developer to form a joint venture partnership, and the agency will begin the selection process—known as a request for proposals—this year, Olson said. “We can contribute the building and the land, but we have to understand how to structure the joint venture partnership,” Olson said. Olson said VIA will be looking to generate some kind of cash flow from the mixed-use development, which could involve new buildings. When VIA purchased the buildings two years ago, the structures had been sitting vacant for 20 years, Olson said. The buildings rest on the other side of the tracks from the Bexar County Adult Detention Center and the entrance to Haven For Hope homeless center. Olson likened the project to the Salesforce Tower in San Francisco, which is a multi-block, multi-level transit center with other components such as housing and a public park. A local example would be Brooks, a 1,300-acre mixed-use community where VIA’s Brooks Transit Center is expected to open this spring on the northwest corner of South New Braunfels Avenue and Sidney Brooks Street. Through North Medina Street, the Scobey property connects to the VIA Centro Plaza, where it services 17 routes including the Primo service. The project’s architect, Douglas Architects, will design the site’s parking garage in a way that it can be converted into another use if it’s no longer needed. One way would be to design the garage so that each floor is level and no sloped. “The idea is that you design the ramp to be outside the main structure or design it so the slope is at the minimal side of the parking structure,” Olson said. Olson said VIA is not collaborating with UTSA’s downtown expansion, which includes a 1,500-bed student housing tower between 10 and 15 stories in height to be built on a parking lot two blocks southwest of VIA’s Centro Plaza. Groups such as the Westside Preservation Alliance and the Esperanza Peace & Justice Center have asked that UTSA reach out to the West Side communities that could feel the effects of the rapid incoming growth. “We have witnessed low-income to working-case neighborhoods displaced by universities in places like Philadelphia, Harlem, and New Haven (Conn.), and we do not want to see the historic West Side erased by what may ultimately be good intentions for increased student enrollment,” community organizer Yaneth Flores told the City Council on behalf of the groups in the fall. Nearby, at 811 W. Houston St., nonprofit developer Alamo Community Group is planning to build a 160-unit, four-story apartment structure where the majority of units would be offered to people making less than 60 percent of the area median income (AMI), or $40,800. South of Guadalupe Street, near San Fernando Cemetery No. 1, the San Antonio Housing Authority and Mission DG (which includes partners of 210 Developers) are partnering on a mixed-income project where half the units would be rented to people at market-rate prices, and the other half to people making 80 percent AMI—or, $53,440—or below. The map in this story has been corrected to accurately show the properties that comprise the Scobey complex.